If you go into any land-based casino then there is a very good chance you will come across either Da Vinci Diamonds or Renoir Riches. Both games are built by IGT and are very similar in that they have tumbling reels as opposed to the normal spinning reels. 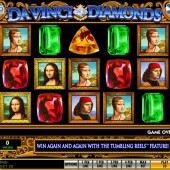 There is an online version of Da Vinci Diamonds that has been released by IGT. Having played the online version I can tell you that it is not as exciting as the land based version, but does have a higher payout (RTP) of 94.93%. 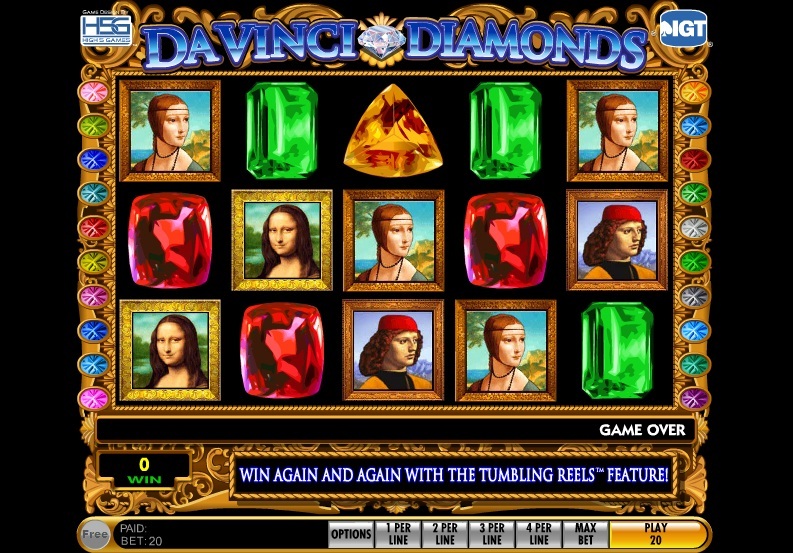 As previously mentioned, it is the tumbling reels that gives Da Vinci Diamonds a different feel to other video slots. The symbols appear to drop on top of one another and then make a sound like clinking a glass as they land. Personally, I can find this a bit annoying after a while and I never find myself playing the game for more than about 30 minutes. There are two main ways to get some decent wins on Da Vinci Diamonds. The first is the tumbling reels, where symbols on a winning line explode and those above fall and create new ones, similar to the NetEnt slot Gonzo's Quest. This can continue on and on, forming some very nice wins. The other is the bonus round, which is triggered by getting three bonus symbols on reels 1, 2 and 3. This will reward you with 6 free spins, which doesn't seem that much as first glance. However, with the tumbling reels and extra bonus spins, this can be hugely rewarding. Da Vinci Diamonds is definitely something refreshing to the normal spinning reel video slots, but some of the game noises can get a bit annoying in my opinion.